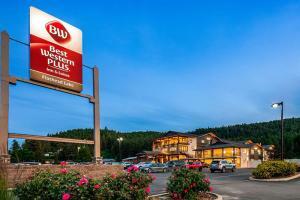 Best Western Plus Flathead Lake Inn and suites has been newly renovated to provide a lovely Montana lodge ambiance with its exceptional amenities and services. Indulge in the complimentary full hot breakfast served daily. Relax and unwind in the comfortable indoor pool and hot tub, both are open 24 hours giving you the option of an early or late swim and plenty of time to relax in the hot tub. Enjoy the large grassy area out back, perfect for families who want to play catch, kick a ball around or simply star gaze. The comfortable guest rooms feature a fridge, microwave and in-room coffee bar. Complimentary Breakfast- Fully cooked in house breakfast buffet including homemade items; Cocktail Lounge- light menu including homemade 7" pizzas, pastas, lasagna, soups salads and various appetizers. Comfy Lounge with homey atmosphere with beer and wine available from 5-9pm.